American Airlines executives and crew cut a ribbon at Miami International Aiport Monday morning before the first commercial flight from Miami to Havana in more than half a century. That’s not because the Miami-Havana flight wasn’t historic. In fact, it was more momentous than the JetBlue trip – certainly richer in symbolism – given the bitter animosity between Miami and Havana ever since the Cuban Revolution took power in 1959 and forced millions of Cubans into exile in South Florida. But the celebration of that flight, and hopes for the reconciliation Martinez spoke of, were significantly tamped down by two developments over the weekend: first, the death of Cuban Revolution founder Fidel Castro Friday night at age 90; second, remarks by U.S. President-elect Donald Trump’s camp that he definitely plans to undo normalized relations between the U.S. and the communist island. The American flight found a Havana in mourning – nine days of it, actually, until Fidel’s funeral in Santiago this Sunday. Meanwhile, it had just left a city whose more conservative Cuban leadership has found its mojo again, thanks to Trump, and which hopes to yank U.S.-Cuba relations back to the punitive, island-isolation policies of the cold war. Cuba’s own conservative hardliners, especially the geriatric revolutionaries known as los históricos, would love nothing better. Fidel’s demise makes their iron-fisted dominance vulnerable, and a hostile U.S. turnabout – the great yanqui threat only they can thwart – is just the thing they need to shore it up again. The key question, then, is whether President Raúl Castro – the younger and more pragmatic brother to whom Fidel handed the reins of his authoritarian regime 10 years ago – will pursue more economic if not democratic reform in Cuba now that Big Brother’s shadow has finally been lifted. Keep your expectations low, say Cuba experts, but don’t abandon hope. “Fidel’s presence was a real drag on the current [Cuban] leadership,” says Brian Latell, a senior research associate at Florida International University and a former CIA analyst who kept a close watch on Fidel during his half-century-long rule of Cuba. Latell notes Fidel was “quite enraged” by the speech President Obama made during his historic visit to Havana in March, in which he challenged Raúl Castro to give Cubans more political and economic freedoms – especially access to the Internet. "But much of that was focused on Fidel. Now that Fidel is gone, [it] may have a harder time remaining as potent – and Raúl may feel less encumbered, feel less of an obligation to bow to his brother. 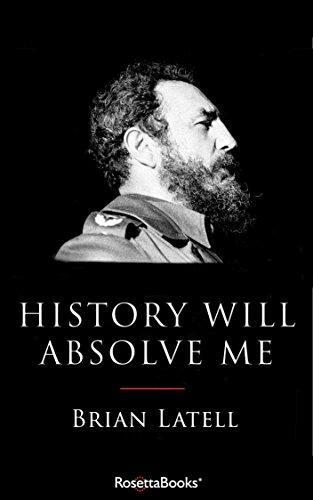 Former CIA analyst Brian Latell's new book: "History Will Absolve Me: Fidel Castro Life and Legacy." “They key operative word is ‘could,’” says Latell’s FIU colleague Frank Mora, who heads the university’s Latin American and Caribbean Center. Others, like John Kavulich, head of the U.S.-Cuba Trade and Economic Council in New York, are more pessimistic. All of which are big reasons there was no confetti greeting American 17 when it landed in Havana on Monday. Fidel Castro may be dead, but his shadow lurks over the Cuban economy even as it absorbs -- oftentimes resists -- the biggest changes in its relationship with the U.S. in more than a half century. At the same time, a new American president-elect has promised to extract more freedoms and restitution from Cuba if the new economic engagement is to continue. The Sunshine Economy looks at this double challenge in the economic dealings between South Florida and the island. The first commercial flight from Miami to Havana in more than half a century left Miami International Airport at 7:30 on Monday morning. American Airlines crew and executives cut a ceremonial red ribbon at Gate D30 before 125 passengers boarded flight 17 to Havana. Airline employees handed to all on board commemorative straw hats for the occasion. Fidel Castro's death will no doubt spark a robust debate about what Cuba would be like today if he had never come to power in 1959. But here's another important question: What would Miami be today without Castro and the thousands of exiles his communist revolution drove to South Florida?